I want to visit Islay, Scotland, with my wife! This blog entry will be my notebook on how to get there, where to stay, where to eat, what to see, etc. By plane, Schiphol to Glasgow then on to islay airport. The only way to get to islay seems to be flighing in from either Oban or Glasgow. So Glasgow it is! The air service from islay to Oban is not flying to Glasgow as far as I can see, but I was not intending to go to Oban anyways. Well not on this trip I am not. Just for fun I tried looking up what a trip in the beginning of March would cost. Turns out the costs are not to bad! For about € 250 per person we can make the trip! The prices are dependent on for when you book and how much time in advance. I will do some further checking on Flybe.com to see if I can find a most cost effective connection. Ones on/in Islay we we need to get around. The options would be to arrange transport by taxi, public bus, rental car or an organised touring company. Two car renstal are available on islay. Both Islay car rental companies offer pick up at airport, islaycarhire.com & carhireonislay.co.uk I won't be considering this option because of two reasons. One is left hand driving and the other is finding a designated driver. The extra costs are also a reason for choosing another option. Since my higher education I have always traveled by public transport and since all the distilleries are all located near a bus stop I choose to take the public transport option. If need be I will get a taxi. 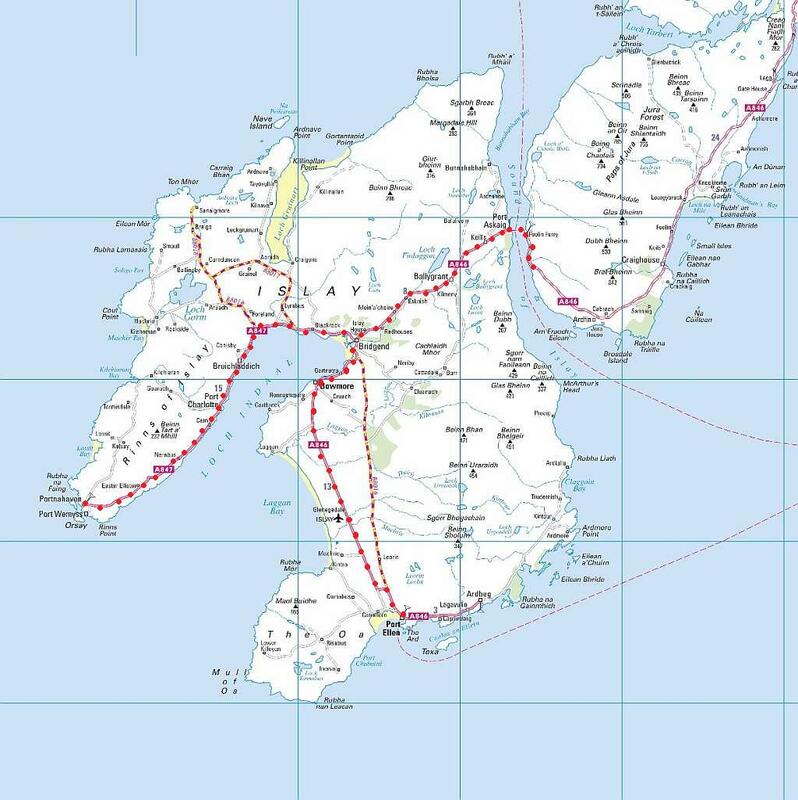 The photo below indicates the routes available on islay for public bus transport. After figuring out all the ferry sailing times I found out that, in my case, none really connect back well enough to allow me comfortable travel to and from Islay without not making the ferry or the flight back using the bus. Also the connecting bus to kennacraig departs from mid city Glasgow and this adds to travel time. So in the end we decided to get a rental car and this allows us to comfortably make crossings in time. I found out that my employer has a discount arrangement with Hertz which is saving 10-20%. I learned that booking the ferry works like this if you want a spot on the ferry. If you can book it, then its available. So, if you can select a time on the booking site of the ferry, it means that the ferry was not full at the moment you are booking. If it doesn't show up in the booking options while booking that ferry is full! At the end of the online booking session you get a two page pdf confirmation via email. For accommodation I was adviced to check out multiple options by contacts on Twitter. Right next to Bruichladdich distillery is An Taigh Osda bed and breakfast. Great views and excellent food. For max of £80 per person per night. The ballygrant inn is good and price is ok and easy enough to get to Bruichladdich. Here the date of booking really limited our options for finding an accommodation. My advice in retrospect is to BOOK EARLIER!!! Lol! Now we ended up in the hotel of one of the most popular pubs on Islay! The horror!! And that for €80,- pppn. The Lochside hotel in Bowmore is our home for three nights. I like to taste the local kitchen. 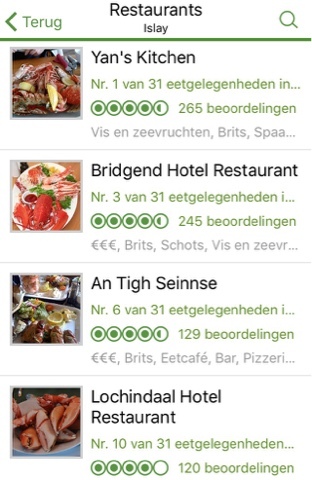 Since Islay is obviously an island seafood would be on the menu. Filtering this on trip advisor I got this listing. Total cost for three nights will be about €650,- increased with cost for additional tours. Personally I think it would be well worth the trip since this idea has become something of a "bucket-list" goal in my life. Why that is is not for this blog, but I believe more and more that delaying the opportunity to life now is not a wise thing to do. You may not be around to live a dream. So don't delay what you can do now! Thank you Armin of Islay Blog for the answers to many questions!! Check out http://www.islayblog.com/ for his blog! Hi jude! Thanks for the tip! I will probably need to eat at Ardbeg anyway since I'm doing the "deconstructing the dram tour", which needs food before or after!! Ha! !